Sister Michel Marie Graham, I.H.M. 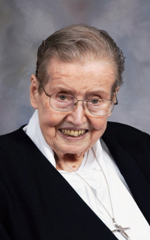 Sister Michel Marie Graham, I.H.M., formerly Ann Elizabeth Graham, died in March 29 in Camilla Hall, Immaculata, in the 65th year of her religious life. She was 87 years old. Born in Washington, D.C., Sister Michel entered the Congregation of the Sisters, Servants of the Immaculate Heart of Mary in 1948 from St. James Parish in Falls Church, Va., and professed her vows in 1949. Sister Michel spent most of her religious life teaching high school in the Archdiocese of Philadelphia and the Diocese of Allentown, plus 20 years at Bishop O’Connell High School in Arlington, Va. and 21 years at Immaculata High School in Somerville, N.J.
She retired to Camilla Hall in July 2010. The funeral Mass, attended by many faculty members and former students of the high schools, was celebrated April 3 at Camilla Hall. The celebrant and homilist was Father William E. Dean. Sister Michel is survived by members of her religious community and two cousins. She was predeceased by her parents Wayne and Lydia Messersmith Graham.